The Commission for Educational Exchange between the U.S., Belgium and Luxembourg is looking to hire a Program Officer, to begin at our offices in Brussels in early January 2019. This program officer will be primarily responsible for the Fulbright U.S. Student and Scholar Programs, and will work in coordination with the Foreign Fulbright Program Officer. Supporting the organization of program related events. Practical experience in field of educational or cultural exchange. In addition to an annual salary to be discussed based on the candidate’s qualifications, this position offers flexible hours, extensive vacation time, monthly cell phone plan, educational/governmental networking opportunities, and dedicated funds for professional development opportunities. The Commission for Educational Exchange between the U.S., Belgium and Luxembourg is a Fulbright Commission and EducationUSA Advising Center that advises international students about higher education in the U.S. and administers merit-based grants for graduate study, post-doctoral research or university lecturing in the U.S. for citizens of Belgium and Luxembourg as well as research grants for EU citizens through the Fulbright-Schuman Program. 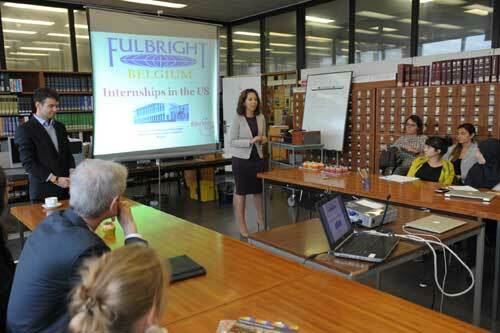 For more information about the Fulbright Commission, please visit www.fulbright.be. 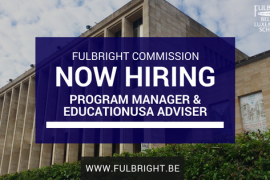 To apply, please send a resume and cover letter to Executive Director Erica Lutes at director@fulbright.be by 21 November 2018. The successful candidate will begin working in early January 2019.